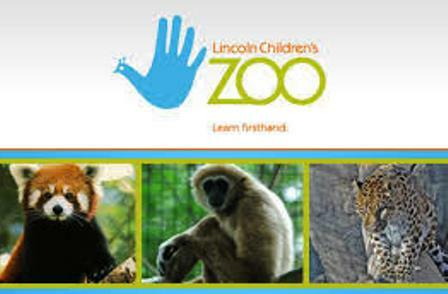 Linda Burton posting from Lincoln, Nebraska – It once was named Lancaster, but its name was changed in a political ploy. It wasn’t built on a large body of water or near any mountains. Without those moderating influences it has a highly variable climate, subject to bitter cold in the winter and heat waves during the summer. Frequent thunderstorms often produce tornadoes and blizzards are possible in the winter. It has little development outside its city limits and no contiguous suburbs. It doesn’t sound like a very appealing place to live, does it? But wait. 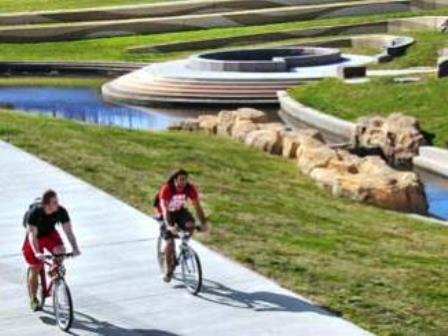 This city, built on gently rolling hills, has over 6,000 acres of parks and natural land, 7 recreation centers, 128 miles of trails, 10 public pools and 5 city golf courses. The goal of the city planners is to have a park area within a half mile walking distance of each residence in the community; in fact, the tagline says “parks and recreation are FUNdamental to the city’s quality of life.” There’s more. A canopy of 125,000 public trees covers the city; 87,000 of them line the 1,217 miles of streets. 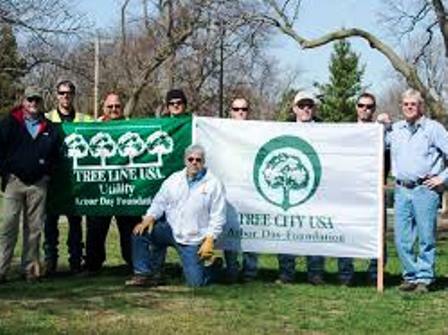 In fact, the city has been nationally recognized as a Tree City USA by the National Arbor Day Foundation every year since 1976. 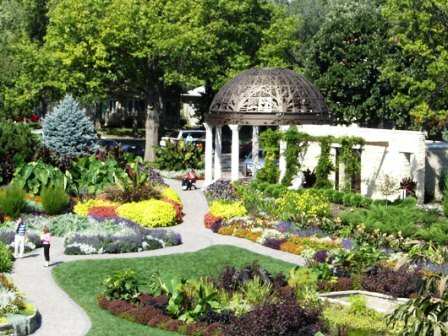 And oh yes, the CDC has put it high on the list of “healthiest cities in the USA.” I’m talking about Lincoln, Nebraska, ranked as the 14th most populous capital city with 258,379 (US 2010 Census) residents who are proud to call it home. And it’s been around since 1856, even though it was Lancaster back then. Let me explain what led to the “political ploy” that changed everything. And then I’ll take you around to some of present-day Lincoln’s beautiful neighborhoods. When President Andrew Johnson signed the bill making Nebraska the 37th state on March 1, 1867, a fierce struggle was raging over the location of the new state’s capital. 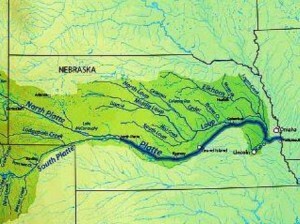 It had been in Omaha since 1854 when Nebraska Territory was created, and although the current capitol building was well located in relation to Nebraska’s 1867 population, it was north of the Platte River, a tributary of the Missouri that cuts across the state. Those living south of the Platte charged “lack of legislative representation” and launched a major verbal and legal initiative to move the seat of government to their part of the state. The battle was hot; fists and guns were brandished; in an attempt to squelch the move, Omaha Senator Patrick proposed removing the words “capital city” from the bill and substituting the word “Lincoln,” hoping to revive Civil War hatreds. The name was accepted but the ploy failed; capital removal became a fact. Fast forward to 2013. 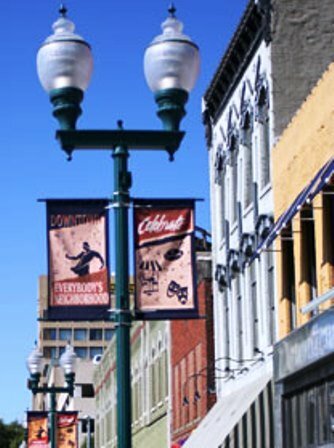 Flowers bloom profusely in the median of tree-lined streets where banners designate neighborhood names; neighborhoods that tell the history of this city where more than a quarter-million people live today. Arnold Heights, also called Airpark, started out as base housing for Lincoln Air Force Base during the Cold War; a thousand housing units. It was annexed by the city in 1966 after the base closed; now it’s a mix of duplexes and single family homes. Bethany was a village originally laid out by the Disciples of Christ; it was annexed in the late 1920’s. Capitol Beach, home to Capitol Beach Lake, is just west of downtown; College View surrounds the Union College campus; its buildings resemble those of a small town. Cripple Creek, north of Pine Lake Boulevard, is a collection of fairly new middle-to-upper-class homes; East Campus has a historic district referred to as Professor Row; it borders the University of Nebraska East Campus. When the city expanded eastward and developed Gateway Mall, the Eastridge neighborhood grew; mostly single-level ranch-style homes are there; the Everett neighborhood near downtown has historic apartment buildings and converted houses. Fox Hollow is a planned subdivision that was begun in the 1970’s; Havelock once was a separate town and still has its own Farmers Market on Tuesday afternoons. The Hartley neighborhood has houses built between 1890-1940; the Hawley Historic District, east of UNL’s downtown campus, is early 20th century. Haymarket is one of Lincoln’s oldest neighborhoods; its historic warehouses have become an urban living district today. The Historic Bungalow District, also known as Woods Park, includes a number of bungalows built around the 1910’s and 1920’s; the Lincoln Children’s Zoo & Botanical Gardens is located in this neighborhood. The Irvingdale neighborhood has a mix of homes, from the early 1900’s to the 1950’s; you’ll find the Stransky Park concert series here. The Near South neighborhood is home to many of Lincoln’s grand homes of historical significance and architectural value; it is currently experiencing a revitalization effort as apartments are being reconverted back to single-family homes. The Sheridan neighborhood was the first area in Lincoln that changed from the “grid pattern” to winding side streets; it is listed in the National Register of Historic Places as the Boulevards district. 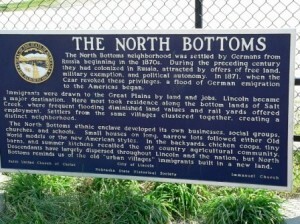 Russian Bottoms is another historic area, originally settled by Volga German refugees from Russia. The small houses in the area north of UNL’s campus are rented by students today. University Place, near Nebraska Wesleyan and UNL’s East Campus, was an incorporated community before it was annexed in 1926; it retains its historic 68504 zip code and its historic shopping district; the homes are characterized by wrap-around porches. 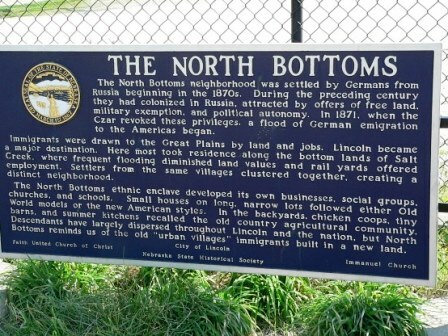 A beautiful day in the neighborhoods, in a city that may not have mountains or rivers but is rich with parks and pools and trails and trees; it may have been pooh-poohed in the beginning but tiny Lancaster-turned-Lincoln has remained the center of government for the state of Nebraska since 1867 and is the 13th most populous capital city today. All that rain from summer thunderstorms just keeps it green; and no worry about blizzards – since winters are relatively dry, the snow melts off fast.